Filed to: S.H.I.E.L.D.Filed to: S.H.I.E.L.D. One of the biggest reasons to be excited about Joss Whedon's S.H.I.E.L.D. 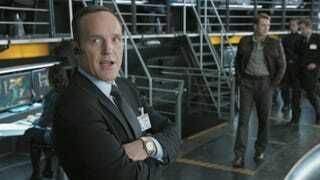 show is the return of Clark Gregg as Agent Coulson. But what if the series doesn't get picked up by ABC? In an interview with Crave Online, the actor reveals that the small screen might be the only place we see Agent Smith. And if ABC doesn't pick up this series, we may never see him again. Then again, Whedon famously asked Gregg to be in the Avengers while backstage at San Diego Comic-Con so we know he likes to play it fast and loose. Don't make us send you bloody Captain American trading cards, ABC!